A trampoline mat is typically made of fibers that are designed to bounce you as high as possible while being able to withstand UV rays, harsh weather, etc. Although, what a trampoline mat is made of and what it can handle exactly will depend on the individual brand and/or manufacturer you make your purchase from. However, there may come a time during the life of your trampoline where it may need some replacements. In most trampoline replacement cases, it will need new springs or even a new mat. 6.1 How long do trampolines last? 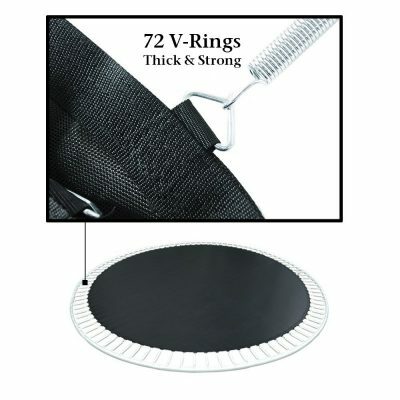 6.2 Can I replace trampoline mat and springs? 6.3 How long will it take to replace a trampoline mat? Over time, you may notice that there is less bounce in your trampoline mat. It could be that the springs are not as springy as they once were, or it could be the fibers in the trampoline mat weakening due to the weather elements or prolonged use. Trampoline mats, over time, can weaken to the point where they develop thin spots or small holes in the material. Because of this, jumping on a trampoline mat with some wear and tear, no matter how minor or major it is, is completely unsafe to do. You’ll have to make some repairs, but replacing your trampoline mat altogether is a much better route to take. Though it may seem easier to get some patchwork repair done on your trampoline mat, replacing it with a new one is the better choice. 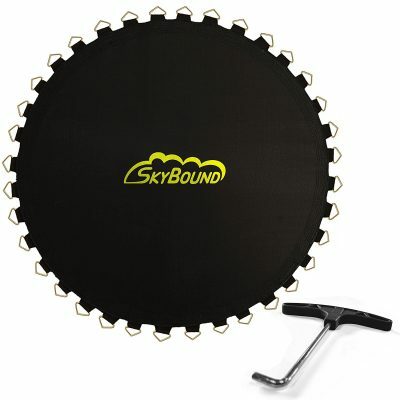 SkyBound has a wide variety of trampoline mat replacement sizes that range from $50 to $100. To get the right size for your trampoline, you will need to measure your trampoline’s frame, the springs when they are not stretched, and count the number of springs. The Round 12’ Replacement Trampoline Mat by PARTYSAVING costs approximately $50, is 12’ in diameter, and is designed to be used with trampoline frames that are 14’ in diameter. It’s constructed from UV-resistant, heavy-duty polyethylene weaved mesh with 72 durable, thick rings made of galvanized steel to attach to the springs and the frame. 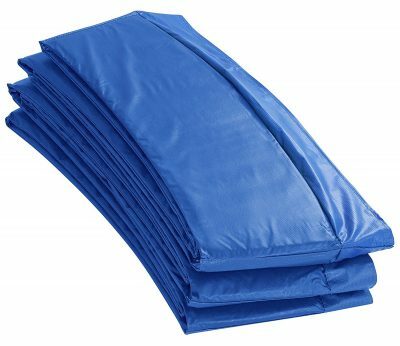 Upper Bounce has a number of trampoline mat replacement sizes available, ranging in price from $37 to $138. All of their replacement mats are resistant to UV rays, water, and fading, each made with heavy-duty premium polypropylene mesh materials with 8 rows of stitching. You will, again, have some measurements to take before you decide if this is the right replacement for your trampoline. 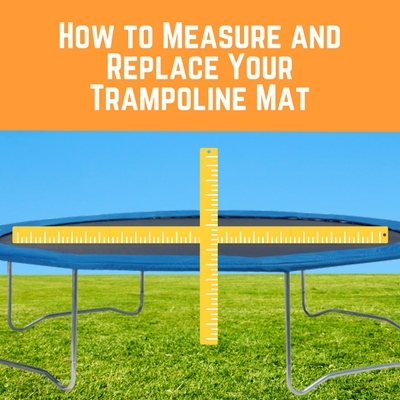 The first, and most important, part of trampoline mat replacement, is going to be for you to learn how to measure your trampoline and your trampoline mat. You will need to do this because not everyone will know for sure what size trampoline they have. For a round trampoline, you will need to take several measurements. It’s best if you have help because you will be measuring from one side of the frame to the other as you walk around the entire diameter, making notes of the measurements in inches. You will then need to measure a completely relaxed spring, requiring you to take a spring off your trampoline to measure it. You will also want to count the springs so that you know how many holes your replacement mat will need. For rectangle trampolines, you will need to measure the mat from the inside of the frame, one long side and one short. If you have an octagon trampoline, you will want to measure from the corners and the outside of the frame as you walk around. In all cases, you will need to count the springs and measure them to make sure you have the right amount of spring support when it comes to finding a new replacement trampoline mat. Because trampoline mats are not a “one size fits all” type of thing, you’ll need to keep a couple of things in mind when you’re looking to replace your current mat. For starters, knowing the make, model, and size of your old mat will help you to find a new one. Looking for a replacement trampoline mat that works with your region’s climate is never a bad idea, either. For example, if it rains a lot where you live, consider getting a replacement mat that is resistant to water. You should also keep an eye on the stitching, as well. More stitching means a stronger trampoline. Therefore, if you need a replacement mat that boasts a higher weight capacity, look for the one that has the most stitching. You’ll also want to keep this in mind because of the frame and the rings. Wear and tear can stem from the frame and the rings more than the actual mat itself, which is also why stitching is so important. Finally, the v-rings should be made from galvanized steel. Though this is something that is often overlooked, it’s actually what will keep your trampoline in good shape entirely for years to come. Replacing your trampoline mat is one thing, but replacing the whole trampoline is a completely different story. Replacing the mat, springs, and frame pad is easily done, but where the frame is concerned, you need to know when it’s time to invest in a new trampoline. If your trampoline’s frame is rusty, wobbly, or has any issue whatsoever, after a couple good years of use, you need to check it out. Once your trampoline’s frame starts to give way and cause issues, no matter how many of the other parts you replace, there really isn’t much you can do other than deciding to buy a new trampoline altogether. If you don’t see your question, or an answer to it, listed below in our FAQ section, get in touch with us and we’ll do our best to help you out! The life of a trampoline all depends on the quality and durability that it holds. However, the average trampoline can last anywhere from 5 to 10 years. The life expectancy also depends on how well you take care of it, whether or not you’re replacing any parts that need to be swapped out, etc. Can I replace trampoline mat and springs? Certainly. The mat, springs, and pad can all be replaced should you choose to do so. 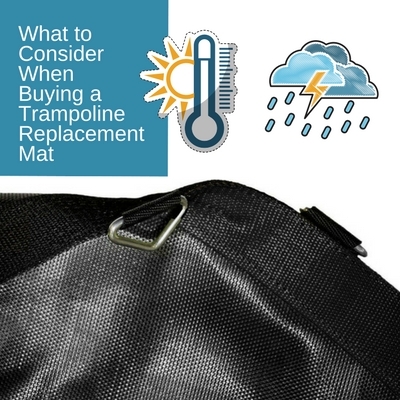 How long will it take to replace a trampoline mat? The amount of time it will take to replace a trampoline mat will depend on the size of your trampoline, whether you’ve done it before, and whether you’re replacing it by yourself or with someone who is there to help you. Ideally, you should not be doing the replacing by yourself, because it will take quite a bit of time to do so on your own.